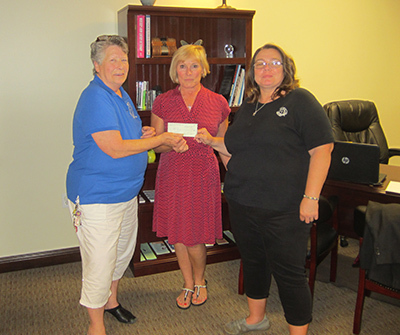 GFWC Utah made a donation to the Hill Air Force Base’s Spouses’ Belle of the Ball program. The formal and semi-formal dresses are “rented” to military personnel, their spouses and children, civilian base personnel, and anyone who has access to the base. They can rent the dresses free of charge for military balls, proms, weddings, or any event that requires a formal dress. 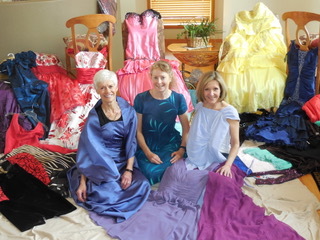 GFWC Utah donated 155 dresses along with shoes, purses, and jewelry. 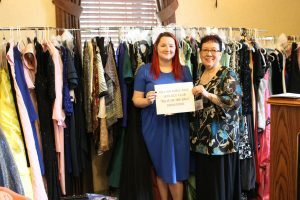 Taylor Williams (left), director of the program, accepted the dresses from Linda Kuwana (right), President of GFWC Utah. Taylor had to come the next day with an extra car to transport everything. She was “blown away” at the generosity of the Utah membership. Members of the GFWC Park City Athenaeum Club (Utah) were one of the clubs who joined GFWC Utah in collecting gowns to support military women. They gathered approximately 60 fabulous gowns. Members had fun “modeling” three of the gowns from the collection before packing them up for delivery. and Lynette McAferty (Club Historian and Membership and Communications Coordinator). GFWC West Side (Pennsylvania) also had supporting military women on the mind! They donated Mommy Bags to new mothers at Veterans Administration Medical Center in Wilkes-Barre. 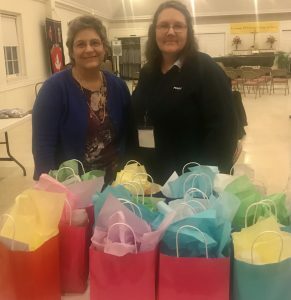 The bags contained personal items for moms, such as: body wash, lip balm, hand sanitizer, tissues, sticky note pads, ink pens, hand lotion, chocolate bars, snacks, and a personal note of encouragement and thanks from the women of the club! Co-chairmen of the project, Mary Seyfert and Heide Cebrick. 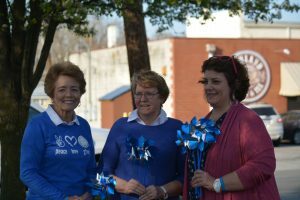 GFWC Virginia President Kelly Lane joined GFWC Virginia Lee District President Carol Outten and members of the Henry Clay Woman’s Club of GFWC in planting a Pinwheel garden at the Ashland Town Hall. This is the fifth year that the club has planted the garden to mark April as Child Abuse Prevention Month! They were joined by Assistant Town Manager, Matt Reynal, and other members of the town staff who were invited to participate.